For those of you who manage social media posts, it can be frustrating to log in, check your page, and boom—many (or all) of the photos are missing from your Facebook business page posts. This can happen when you change website platforms, change the image file names, or change page URLs. At first, this issue is frustrating and seemingly impossible to fix. I’ve spent hours trying to resolve it myself. But when Veronica from Yolofsky Law faced the issue herself, we were able to find a solution. We can now say that this problem is resolvable, but it’s not the most obvious fix. Facebook has a debugger tool that allows you to enter the URL for the page that contains the missing or incorrect image. The instructions provided by Facebook are not clear, but thanks to some soldiering through, we’ve been able to iron out a process for restoring your images. Go to the Facebook web developer debugger and enter the URL into the box provided. 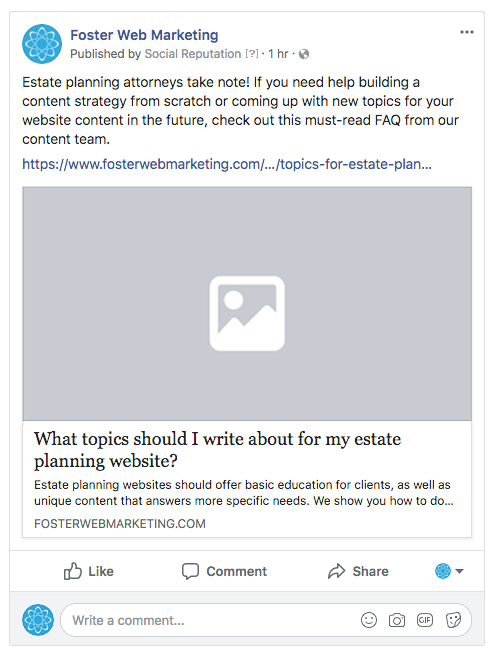 If the new website URL hasn’t been used yet, you will get this message “This URL hasn’t been shared on Facebook before.” Click “Fetch new information.” If you’re working with a URL you’ve posted before, move on to the next section. Scroll to the section “When and how we last scraped the URL” and find the section that says “Link Preview”—it will show a live preview of how the post will look on Facebook. It will not show the image, so you will have to click on the “scrape again” button until the image populates. It works within the first or second try. Go back to the Facebook post you are fixing. Click on the hyperlinked date and then on the 3 dots to edit the post. Click on the refresh share attachment option. That is all you should have to do! Just make sure the page you’re linking contains the image you want to show within the page’s content. Facebook, Why Won’t You Talk to Us? We want to ensure everyone has access to this information. If you’ve dealt with Facebook’s customer service, you already know that it is close to nonexistent. You’re pretty much on your own if you have a problem. This is just one of the recent issues we’ve been able to resolve. If you’re looking to learn more about social media marketing, check out our social media blog. If you need to resolve a specific issue with Facebook or another social media site, call us at 888-886-0939 or fill out a contact form.